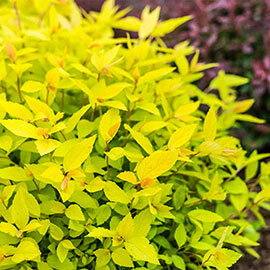 Easy to grow shrub is named for the color the foliage starts out—a unique shade of yellow with oval, sharply toothed leaves. 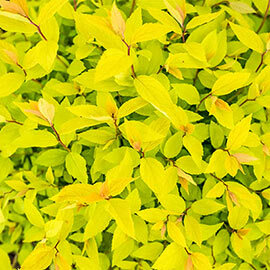 Lemon Princess holds its color longer than most shrubs before fading to green as summer goes on. The leaves provide a bright green backdrop for pink flower clusters from late spring to midsummer. 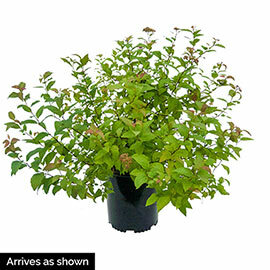 Lemon Princess has a compact, dense, upright growth habit and can reach 1-1/2 to 2 ft. tall. This shrub makes a great specimen planting, is at home in rock gardens or is suitable grown as a low hedge for walkways. Lemon Princess is now shipping in a gallon pot ready for summer planting. Deer tend to avoid this plant. Zones 4-8. Plant in full sun. Grows 1-1/2 to 2 ft. tall. Foliage: Oval-shaped leaves are sharply toothed. Its lemon yellow new growth holds its color longer than most. Flower Form: A multitude of very tiny, pink flowers form flat-topped clusters. Soil Requirements: Prefers fertile, moist, well-drained soil, but will tolerate a wide range of soils. Pruning: Prune to remove dead and broken branches.